Welcome to the Kansas City Learning Sessions! These sessions are the place to learn tunes from Ireland, Scotland, the Shetland Islands, Galacia, Brittany, Cape Breton, and beyond. Our first learning session (LS1) was held back in January 2013, and we began teaching the bodhrán class in November 2013. In 2014 we joined the Kansas City School of Irish Music which began in the Fall of 2006. Our tune-learning classes are open to players of all levels, and may be divided into beginner classes and intermediate/advanced level classes. In our six-week group classes we focus on teaching tunes played in Irish sessions, both local ones and those around the globe. We set out the basic melody, the “bones” of the tunes, and then discuss and illustrate some variations if time permits. These classes will get you started on the road to playing in any session, anywhere in the world! All you need is your own instrument, and a basic understanding of your instrument. In the six-week bodhrán class we work on rhythms for the most common types of tunes: reels, jigs, hornpipes, slip jigs, and polkas. We these basic rhythms and some variations, just to keep things interesting. You will need your own drum and tipper. We have a lot of fun at our learning sessions too, but they are really a stepping stone toward playing in a real session. The session (seisiún in Irish) is the place to find the true spirit of Irish music. This is community music, and needs to be played in a community. Every time you play this music with others in a public space you give it roots in your community. So, get involved in sessions as soon as possible, so you can fully understand what this music is all about. As Eileen Ivers has written, “The core of it all is the seisiún and the infectious joy on the players’ faces as they share in the music and maybe even pass on a new tune to a student of the tradition.” For our local sessions go to either the KC session page or the Lawrence session page. Come enjoy the music! For the current classes and fees visit the KC School of Irish Music. The next tune-learning classes will begin on Monday, April 8, 2019. The Classes. First, the bodhrán class will cover basic rhythms for one of the most common types of tunes encountered in a session, and then work on developing variations on those rhythms. Each meeting we will work on a different rhythms for different types of tunes. Second, in the beginning tune-learning class we work through one tune, aurally and slowly — as slowly as needed. If we do not make it through the whole tune, we will continue with that tune the following week. Third, in the advanced tune-learning class we teach one or two tunes by ear, at a moderate tempo. There will be a short time given during our learning sessions (time permitting) to anyone who would like to share a tune. If you have been working on a tune on your own, this would be the time to introduce it to the rest of the group. During each learning session we may also be reviewing past tunes. Note that bodhrán players are welcome to sit in on the advance learning class, and will have a chance to practice in context. Also note that though students of either tune learning session are welcome to attend the other, the distinction between the advanced learning class and the beginners learning class will be significant. While beginners are assumed to need some work on learning by ear, the more advanced players will be expected to be able to pick up tunes by ear fairly rapidly. The fee for a learning session covers the entire six-week group-ensemble class. You can join the KC Irish Center ($50 for an individual one year membership) and receive a discount. You can also take one-on-one classes instead, or in addition to the group class. Note that the bodhrán class and tune-learning class are separate fees. So, if you want to work on bodhrán skills and then learn tunes, you would need to pay for each. Of course, if you just want to sit through the tune learning session and play bodhrán, or even just hang out to enjoy the fun, there will be no additional fee. In addition to reprising some of the tunes taught in the past two years, there are a number of tunes you might have heard of or wanted to learn. Here are some of the new tunes currently being considered for our future learning sessions, from which we’ll pick a dozen or so. If you see anything you’d like to work on, let us know! Waltzes & Mazurkas: Dear Irish Boy (Edor), Loftus Jones (G), Mooney’s Mazurka (G), New Land (Bm, F), Planxty Hewlett (D), Planxty Irwin (G), Road North (Amix), Shoe the Donkey (G), Sonny Brogan’s Mazurka (D), Tabhair Dom Do Lámh (G), Wexford Carol (G). Learning sessions are not cumulative, so the number of each learning session (e.g., “LS 5”) is given just for convenience of reference, from most recent to oldest. 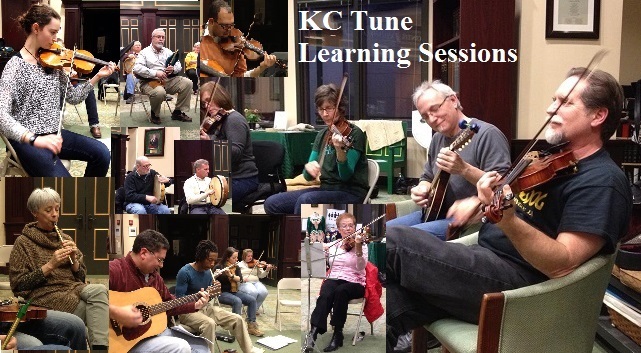 The learning sessions were discontinued in April 2015 in anticipation of the KC Irish Center reopening in a new location. Of course, the relaunch of the music classes took longer than anticipated. Learning sessions are not cumulative, so the number of each learning session is given just for convenience of reference. Our eleventh learning session ended on Saturday Oct. 18th instead of Tuesday Oct. 21st as scheduled because there was just no way we’d find a pub that wasn’t packed on the 21st. Why? The KC Royals were in the World Series! As of LS10 we dropped the student solos. Instead, we provide time at each meeting to those who would like to share a tune they are working on, which was Meg’s great idea. Starting with LS8 we initiated student solos as a learning tool. Each student would play one solo at some time during the six-week session. In the 2014 learning sessions we divided the classes into one hour partitions: with a bodhrán class, a beginners tune learning class, and an advanced tune learning class. Note that the number of tunes is now almost reasonable. We began the KC Learning Sessions in January 2013. At that time I chose far too many tunes to cover at each meeting — as is really obvious from the list below — and so have gradually reduced the number of tunes taught during each six-week cycle. I now think in six hours of class six tunes would be more than enough for those at an advance beginner level. As I was overly enthusiastic at the beginning, there are too many tunes listed below to learn in a year (six two-hour learning sessions running for six-weeks). Below are the tunes we presented, in the first year — LS1 to LS6. If you are thinking of starting your own Learning Session (or Slow Session) any of the tunes below would be good, but choose fewer tunes than listed here. Also, the learning sessions are not cumulative, so the number of each learning session is given just for convenience of reference. As of LS6 we introduced the bodhrán class and added an hour of teaching time. As of LS4 we began having a graduation session at a local pub with friends and family. This also meant that the total number of tunes was reduced. Half way through LS3 it started to sink in that we needed to pare down the number of tunes even further, and work on different teaching techniques. Though we picked fewer tune this time through, it is still too many. I had wanted to do a learning session in KC for some time. When my friend David Agee said he would join me so we could co-teach the learning session, I set it up with the KC Irish Center in December of 2012. The first learning session in January 2013 was a bit uneven in my opinion, and I set out a crazy number of tunes! I had picked four tunes per meeting, but by the fourth meeting I was told that it was “overwhelming.” I chose only two for the last meeting.